In mentioning texture, I don't mean textured glass. Rather I'm discussing a textural finish in the gilding itself. 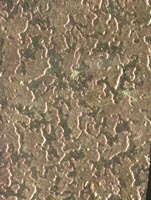 A gilt finish is normally intended to be smooth and blemish free. Sometimes a bit of texture adds additional interest. The basic concept is to use goldsize or varnish which is applied to the glass, worked in some way to achieve a texture and then gilded. It can be gilded directly as soon as it comes to a suitable tack level. Better results are obtained by allowing the goldsize/varnish to dry and then water gilding. You can use a variety of application techniques such as sponge or plastic bag. Lightly dabbing varnish/goldsize on with a plastic bag and then water gilding creates a pleasing broken finish. There are several methods all with a different appearance and many variations according to your own particular style. Another is to apply the goldsize and then work it with a tool for the texture. I have marked in lines and patterns with a point and worked the drying varnish with bags, rags and stipples. I usually only use goldsize, but damar varnish will also hold a texture without flowing out and is suitable. It is worked, allowed to dry to retain the texture and then water gilded. All these textural variations are suitable for the decorative centres of letters and some scroll and feature work.